Baking summer apricots, nectarines, peaches and plums brings out their deep flavors and is a favorite way to prepare them in season. Split the ripe fruit, sprinkle with sugar and bake until the juices flow. Here is a simple yet dressed up way to bake a ripe summer apricot or other stone fruit with a sweet almond filling. It’s sheer luck to find a decent fresh apricot on the East coast. In the US, few people grow them outside California, where the Mediterranean climate nurtures an early bloom. 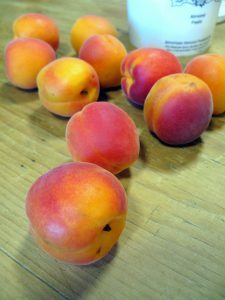 But I bought a bag of fresh organic apricots at The Fresh Market recently, and was pleasantly surprised by their aroma and texture. When I let them ripen at room temperature for a few days, the apricots were succulent. 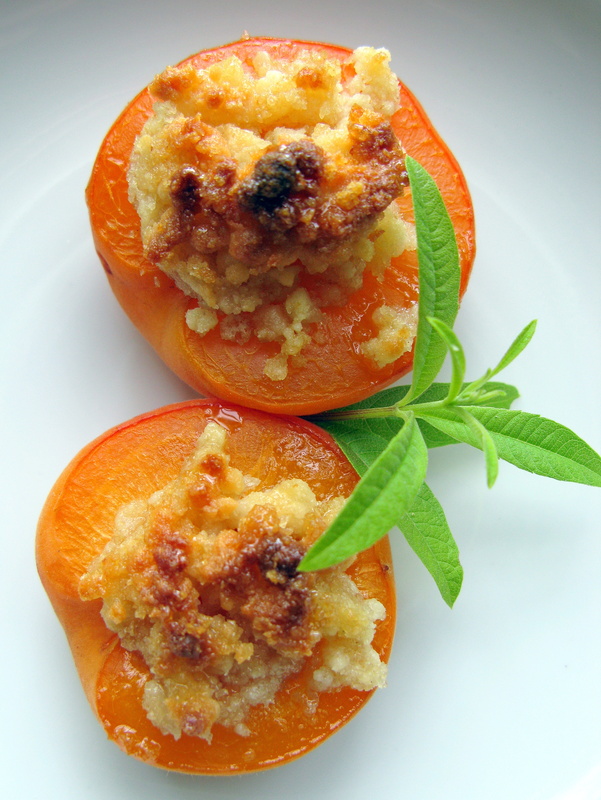 Having more than we could eat, I turned to a favorite way to treat stone fruit, baking them with an almond stuffing. This could not be easier if you have almond paste on hand as I always do. (Absent almond paste, substitute 1/3 cup sliced balanced almonds and 2 Tablespoons granulated sugar.) Delicate orange flower water in the filling matches the flavor of the ripe fruit. A squirt of lemon juice would work well too. Bake the apricots just until they are tender and hot inside. This preserves their juiciness. 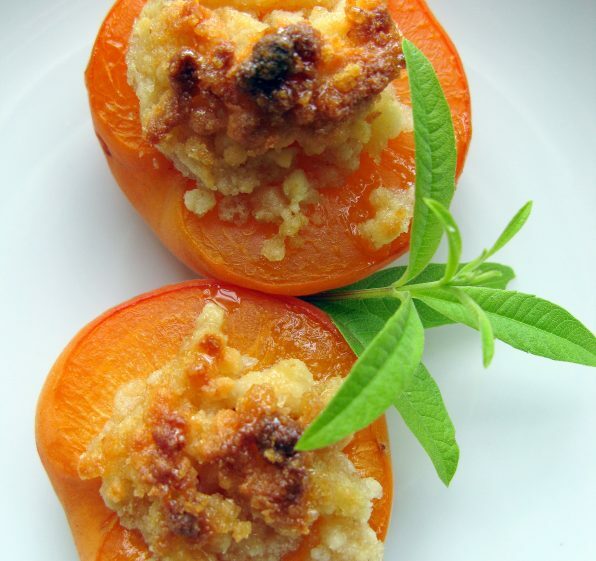 Served hot from the oven, the baked stuffed apricots make a light dessert. Add a glass of prosecco or sparkling wine not to mention a scoop of ice cream and you have something celebratory. Baking apricots, nectarines, peaches and plums brings out their deep flavors and is a favorite way to prepare them in season. Split the ripe fruit, sprinkle with sugar and bake until the juices flow. 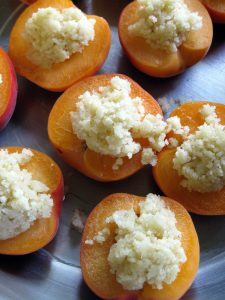 Here is a simple yet dressed up way to bake a ripe summer apricot or other stone fruit with a sweet almond filling. Split the apricots, remove and discard the pits. Butter a 10-inch baking dish. Place the apricot halves, cut side up, in the dish. Process the breadcrumbs and almond paste in the bowl of a food processor until crumbly. Add the butter and pulse until it is well blended. Add the orange flower water and let the machine run until the mixture is light and fluffy, for about 15 seconds. Spoon a scant 1/2 ounce into each apricot half. Sprinkle with the wine lightly moistening the filling in each apricot half. Bake until the apricots soften and the filling browns, for 12 to 15 minutes. Serve with a sprig of verbena. A scoop of crème fraîche, sour cream or lemon sorbet would be refreshing.